Sony has created a professional grade dSLR model that challenges the competition with it's $1999.95 price point for a full frame dSLR, with image quality and resolution rivalling far more expensive camera models. If you want the highest resolution possible for larger prints, combined with best possible image quality without mortgaging your home, you'll want to consider the Sony A850. Read more in our Full Conclusion. 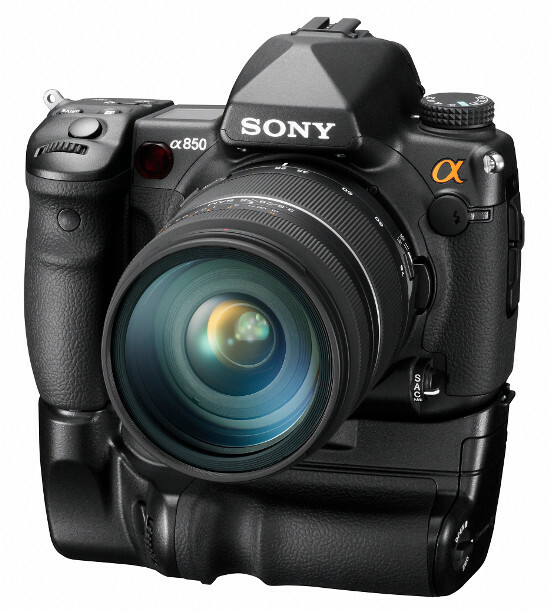 Sony's newest full frame Alpha model, the DSLR-A850 (aka the A850 or Alpha 850) is a powerful dSLR that boasts features that industry professionals demand. These include a high-resolution 24-megapixel CMOS image sensor, fast Dual BIONZ image processor setup, in-body Super SteadyShot image stabilization, weather and dust resistance, dual card slots for CF and MS Duo type media, 9-point AF system, and a broad sensitivity range to name a few. This is one of the most affordable full frame models on the market (as of 4/2010) with a body only price of about $1999US. Be sure to check out our review as we take a closer look at this high-end unit. The DSLR-A550 is available as a body only kit with a MSRP$1999.99US.